The Plaza Hotel in New York City is one of the finest wedding celebration venues anywhere in the world. Timeless, elegant, unique and most certainly upscale. If any of these words describe your vision for your wedding than you should certainly consider the services of internationally renowned, award-winning wedding photographer, Michael ONeill. Located in a Long Island suburb, Michael’s studio and gallery is located just 1 block from the LIRR Northport train station. He often works with clients from NYC that are planning their weddings in any of Manhattan’s elegant wedding celebration venues. From the Plaza to the Parklane, The Waldorf-Astoria to the Pierre, to quaint venues in the fashionable SoHo section of NYC, Michael has the experience and professionalism to work with you to capture the memories of the most important day of your lives. This image was captured on the grand staircase in the main lobby of The Plaza Hotel just minutes before the bride and groom were whisked off in handsome horse-drawn carriages to the site of their wedding ceremony on Bethesda Terrace in New York’s Central Park. 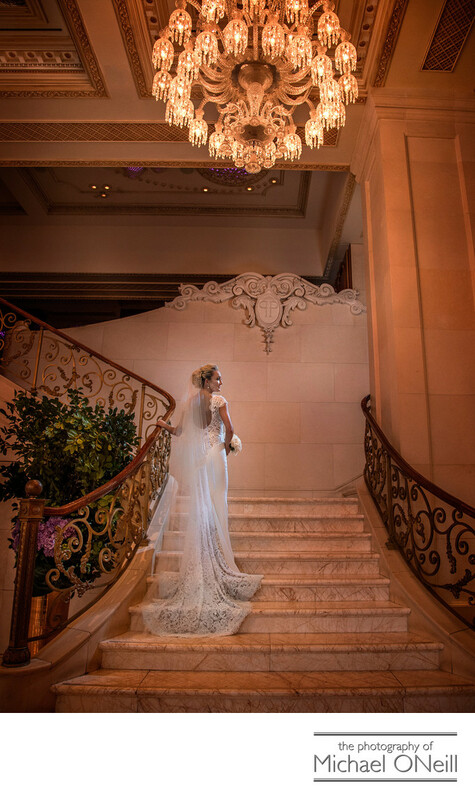 Stunning wedding pictures were created at various NYC landmark locations this day before settling in for the evening at the chic, elegant wedding reception. If you are planning a NYC wedding give Michael a call. After your initial meeting at his East Northport studio and gallery, where he will personally display all of the amazing products and services he offers there is nothing else that can’t be done via email & telephone.